The Daughter of Smoke and Bone audiobook has been one of my absolute, without a doubt, all-time favorite audiobook series ever. Returning, once again to this audiobook, was such an amazing experience. I can't really describe what it's like to become so familiar with a reader, that by the last book, it's almost comforting, like it was made to be read like this. It's just something you have to experience for yourself. The reader, Khristine Hvam does a wonderful job bringing this story to life. She could be, at times, both light, fun, or emotional with Karou's character, and dark and creepy with some of the other characters. I was especially CREEPED OUT with a certain creature who wants to "taste" Karou. *shivers* Her voice for this . . . thing . . . was so perfect! And perfectly chilling! Khristine had distinct voices for all of the characters, making it easy to tell who is speaking, and she delivers those voices flawlessly. Another great thing about listening to this series, in-particular, is that there are a lot of difficult names that Laini has used and I've heard that quite a few readers have gotten tripped up over them, and Khristine flies right through them, pronouncing them with ease and clarity. If you're a fan of audiobooks, this is definitely one you will want on your shelf. If you've never listened, or your experience has been less than awesome, then you need to give this one a try! Khristine and Laini will make you a believer! You can find my full review of Dreams of Gods and Monsters here, and Amy's review of Daughter of Smoke and Bone, here. Whether you've already started this series, and just need the last book, or you've never read the series but want to, we have an awesome giveaway for you! 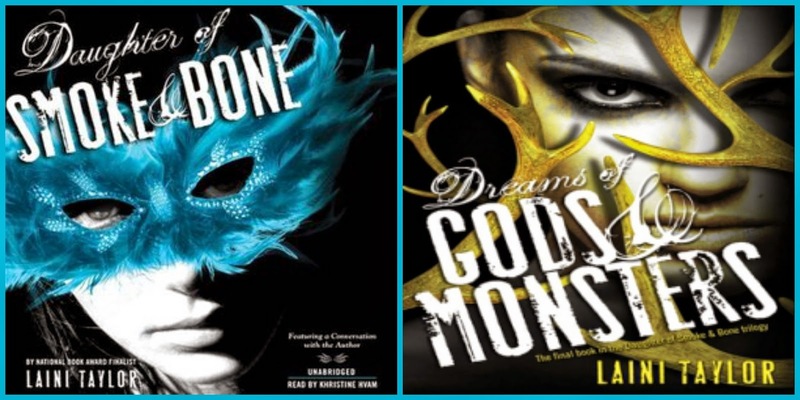 Hachette Audio has graciously offered us three copies of Daughter of Smoke and Bone, and three copies of Dreams of Gods & Monsters to give to lucky winners! Feel free to enter one or both of the giveaways! I have heard of this series and have been trying to get a copy of these two books. They are getting sold out at my local bookstore. Since I have been busy at work lately, I only could make the trip if I've happen to be in the neighborhood. Well, I'm going keep trying. I haven't yet read the books, but I want to! Audiobooks would be awesome! I haven't read the series but I have them on my to-read list. I've listened to only one or two audiobooks and I liked it but I still prefer reading a book that I can hold in my hands. Thanks for the great giveaway! I have never actually listened to an audio book before but I have always wanted to give it a go. I have never read Daughter of Smoke and Bones either. I have listened to an audio book once and I wasn't a big fan, but maybe I just had the wrong audio book. I would like to try again with something better. I've never used an audiobook till now, thanks for the chance to try one. I've heard great things about this series. I have never gotten an audiobook but have considered trying them. I have not read this series yet. Thanks for the giveaway! I have just read the first book... I loved it, I caný wait for the others!!! I'm a big fan of this series, but I haven't really listened to any audiobook, so I can't say that I am a fan of them. I've read the first book in this series and loved it! I would love all three on audio as I love to listen to audio books while I workout! I have no read this yet but have been saving it in my books I know I'll enjoy pile. I also love audiobooks they are great for cleaning and long car rides. Yes! I listened to Daughter of Smoke and Bone on audio! I LOVE audiobooks - listen to one every day. I've read the first book in this series, so I'd love to continue it in audio format! I have listened to a handful of audiobooks but really should do so more often. Would love to "read" this series while driving to and from work! I've read the first one, and have listened to a few audio books. This is a great giveaway, thanks! I love Audiobooks and this series.